Register now and get our informative free e-mail newsletter for nursing professionals -- delivering helpful tips and advice each week! 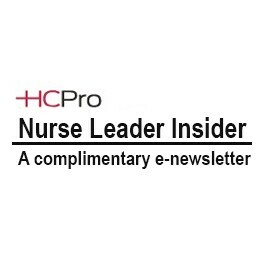 Nurse Leader Insider, brought to you by StrategiesforNurseManagers.com, is a complimentary e-mail newsletter for nursing professionals that delivers helpful tips and advice straight to your inbox each week. Subscribers to Nurse Leader Insider get this valuable information conveniently delivered straight to their inboxes every Friday morning.